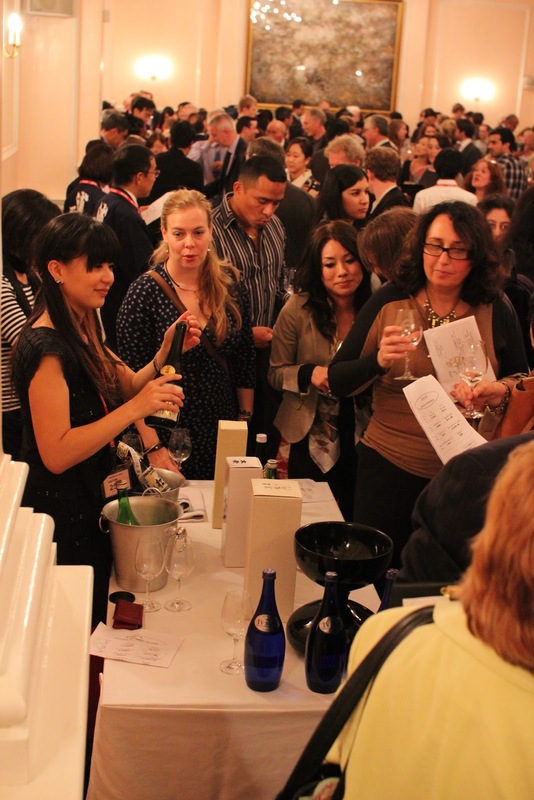 Award winning Sake tasting at The Japanese Embassy. by surrounded by nearly 300 participants filled in the room. they were guests from local wine industries as well as the people in the public. with his "Nabeshima Daiginjo, 2010". calm, gentle and humble yet earnest and competitive. but also Tokubetsu Honjozo and Tokubetsu Junmai impressed me a whole lot. and can not wait to list it on Roka menu. Mr. & Mrs. Fujii of Fujii Shuzo, the gold medal winner by their "Hakurou Koshu 1998". that normally does not have a concept of "vintage". Ichishima Sake Brewery, with trophy winning Hidematsu Aka, 2010. President Ichishima's Happi jacket and Mr. Ake's tie and apron looked great. and his family has been connected to abroad since his grandfather's generation. His sake has been known as "Ichishima" in the US and Europe. Tengimai Yamahai-jikomi Junmai. with Chris from Tazaki Foods. This time, Gorin, new baby in the brewery that Mr. Shata created was on the table! which matches perfectly with the rich European foods and full of "Umami" flavours. Yamahai & Kimoto will be the keywords! Trophy winner with their Kamenoumi Daiginjo Yamadanishiki, 2010. Dewazakura Sake Brewery, won trophy medal with Dewazakura Omachi, 2010. They are always the winner of IWC. This time Mr. Nakano, General manager of sales dept. is visiting for the first time. With Asami san of World Sake Import. with Kikuisami Daiginjo Hiden, 2009. Urakasumi table! President Saura is also the chairman of Sake Samurai Association. with Ms. Funyu from Sales department. their Junmai Daiginjo Kuranohana Urakasumi, 2010 won the gold medal. They are the only brewery from the area affected by Earthquake and Tsunami. This year's special table of Sake from the region affected by earthquake and Tsunami. I was pleased to help serving the Sake on this table. Medal winning brewery all together. Again, massive congratulations to you all! After the event, we went to Hakkasan Mayfair for dinner. who just finished long and busy week consisted of series of Sake events. to know the flavors of their Sake. and to propagate their "heat"to many others. it is such a great mission.